If, as they say, time is a thief, then I know a wine collector who has the opposite effect: he makes moments. He doesn’t collect wine to flaunt his connoisseurship or to create chest-thumping, my-bottle-is-bigger-than-yours displays. His approach is quite the opposite. 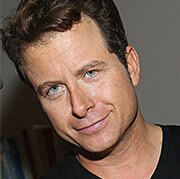 This collector, of course, prizes wine and enjoys watching it evolve through the years. I suspect that he also digs the intellectual complexity and maddening elusiveness that surrounds red Burgundy, his bottle-borne Emile Flöge. But even more than this, he derives quiet pleasure — a delight that registers foremost in his eyes – from sharing his formidable collection with others, including those who can’t necessarily rattle off how many bottles are in a Nebuchadnezzar. In this way, he fulfils the almost talismanic potential of wine to be both an accessory and a catalyst for life’s great gatherings. When else do we find reason to get together as a happy tribe, experience new sensations, and, well, get a bit buzzed to boot? This wine collector – this maker of moments — is all the more uncommon given that many wine enthusiasts (myself included) are guilty of not often enough stepping aside from our daily maelstroms to break out the good stuff. Like dutiful investors, we buy and hold, waiting for just the right moment to justify opening our good bottles for loved ones. We wait to seize a moment that often never happens. So your mandate, fair reader, as is mine, is to use wine to become a maker of moments among your own tribes. Doing so with special bottles heightens the occasion, but it need not involve great expense or effort, certainly nowhere near that which comprised the rarefied tasting described below. It can be as simple as hosting a gather to introduce you friends to the pleasures of Petite Sirah or Chinon or American sparkling wine. Wine need not be any more complicated than that, although three weeks ago, the aforementioned wine collector organized a tasting that was a bit more serious, though no less spirited. 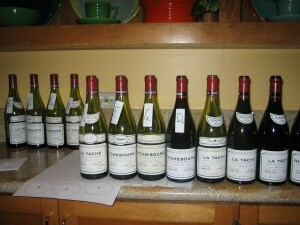 He brought together a group of eighteen friends, most of whom were not wine pros, to taste twelve different bottlings of Domaine de la Romanée-Conti, also known, in venerated tones, as “DRC”. If red Burgundy is the wine type that arguably inspires the most ecclesiastical reverence among connoisseurs, then the vineyards of DRC are wine’s most sacred spot, its Swayambhunath Stupa. Drawing from tiny vineyards in the Burgundian village of Vosne-Romanée, DRC is the source of almost impossibly nuanced and long-lived Pinot Noir, able to display a haunting complexity that transcends words and most mortals’ bank accounts. 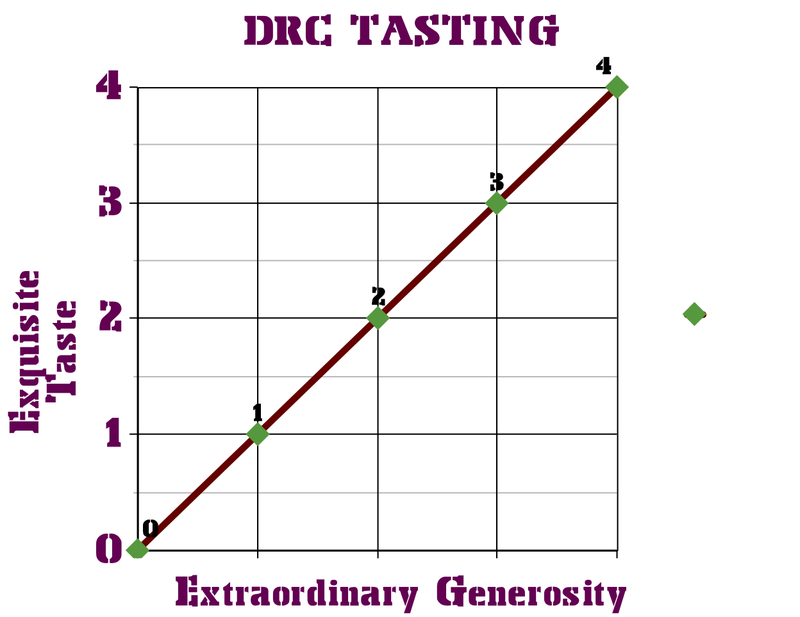 For each of four vintages – 1990, 1999, 2000, and 2005 — we tasted bottlngs from three DRC grand cru vineyards, La Tâche, Richebourg, and Romanée-Saint-Vivant. 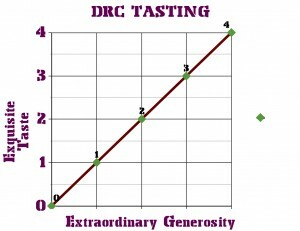 It should be noted that to actually own wines of this caliber, and also be willing to share it on the scale that the collector did, supplying more than enough for both a blind tasting and a sit-down dinner, is a level of largesse that would astonish even the most coddled wine collector. It is the unlikely, moment-making intersection of exquisite taste and extraordinary generosity. All twelve wines were tasted blind, and the group was asked to rank the wines of each vintage from 1 (best) to 3 for which is best for current or near-term drinking.